Ulrich Ostergaard should be back in action. Panthers team boss Carl Johnson is convinced a clash of the SGB Championship titans won’t disappoint tomorrow night. The table-topping city side take on closest challengers Lakeside in a mouth-watering showdown at the East of England Arena (7.30pm). Panthers go into battle one place and one point better off than the Hammers, who boast two meetings in hand. Therefore it’s no surprise that Johnson has described it as a ‘massive meeting’ in the title chase. He said: “It’s the two best teams based on what has been achieved so far this season – and also the two form teams judging by recent results. “We’ve both gone about our business quietly and picked up points home and away. That’s why we’re up there in first and second. “There is only a point between us in the table and it has the makings of being a great meeting as well as a hugely important one. “Lakeside will be coming here to turn us over and go top of the table, but it’s a nice position to be in and we want to stay there. 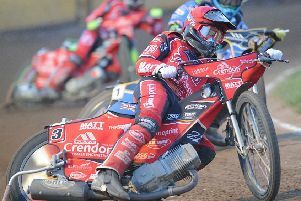 Panthers did open up a seven-point lead at the summit when triumphing 48-42 at Redcar last Thursday, but that was soon slashed as Lakeside recorded back-to-back triumphs against injury-ravaged Scunthorpe on the next two nights. Both clubs have pulled clear of the chasing pack with Panthers boasting a nine-point buffer over Newcastle, who sit immediately below the play-off zone in fifth place. Panthers beat Lakeside 46-44 in their SGB Championship Shield season-opener at Alwalton back in March before losing the return clash 50-40 with both sides advancing to the semi-finals. The two clubs also meet again home and away next month in the quarter-finals of the KO Cup. Panthers are confident they will be at full-strength tomorrow with Ulrich Ostergaard set to return after suffering whiplash and concussion in a frightening spill 10 days ago. Injury victim Emil Grondal is set to take part in some practice laps following the meeting. He is set to come back into the Panthers septet ahead of their July fixtures following the conclusion of Ellis Perks’ short-term deal. PANTHERS: 1 Scott Nicholls, 2 Ellis Perks, 3 Bradley Wilson-Dean, 4 Michael Palm Toft, 5 Ulrich Ostergaard, 6 Simon Lambert, 7 Tom Bacon. LAKESIDE: 1 Nick Morris, 2 Zach Wajtknecht, 3 Adam Ellis, 4 Kyle Newman, 5 Richard Lawson, 6 Ben Morley, 7 Alfie Bowtell.